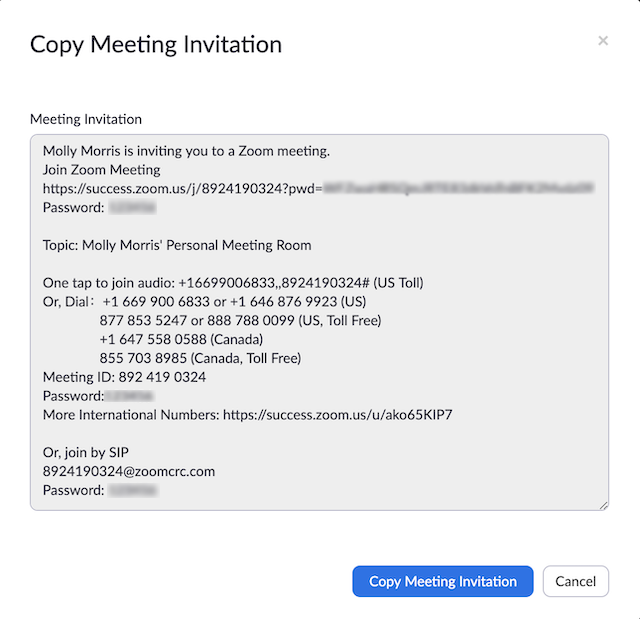 There are several ways to invite participants to a scheduled or instant meeting. Note: You can review scheduling a meeting via the following here. During a meeting, you can invite people to join the conference by clicking on Invite tab in your meeting controls. After clicking on Invite in the meeting controls, click on one of the three email options. Gmail or Yahoo Mail will open a web browser and will prompt you to log you in with your Yahoo or Gmail account. If you are already logged in, a new email will be composed automatically with the meeting information included in the body of the email. After clicking on Invite, click on Invite by Contacts. Select their name from the window, or search for a contact. Click on the individual you would like to invite. You can select multiple contacts. Once you do this, their name(s) will have a check mark next to it and they will appear in the list at the top of the window. Click Invite in the lower right corner. 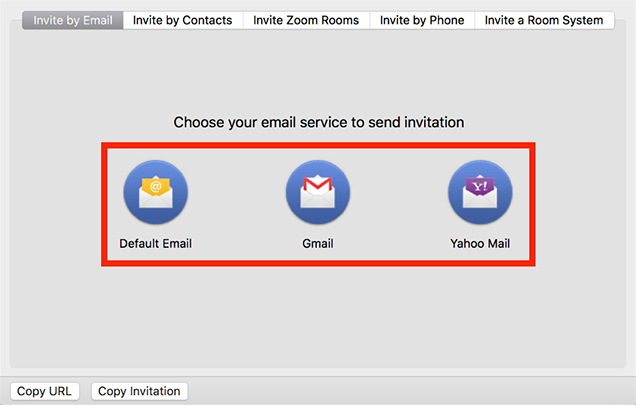 Select contacts and click Invite. Note: Learn more about our Contacts feature here. Click Copy URL or Copy Invitation if you want to send your instant meeting information elsewhere. Copy URL will copy the join link and Copy Invitation will copy the full invitation text. You can then paste it using ctrl-V on a PC, cmd-V on a Mac, or by right-clicking and choosing Paste. Schedule a meeting either on the Web in My Meetings or through the application directly. Log in to the Zoom application. Select the meeting that you want to invite others to. Click Copy Invitation. The meeting invitation will be copied and you can paste that information into an email or anywhere else you would like to send it out. Login to the My Meetings. Click on the topic of your meeting. Next to Time, there are options for adding to your calendar. If you click on Google Calendar or Yahoo Calendar, it will create a calendar event automatically in the specific email service you choose. If you click on Outlook Calendar, this will generate a .ics file that you import to your Outlook calendar. You can also manually copy the meeting information by clicking the text that says Copy the invitation. If you click on Copy the Invitation, another window will open with the meeting invitation text. You can copy the invitation and send it out through email or elsewhere.